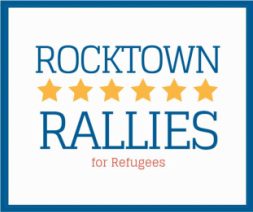 ﻿In 2016, Rocktown Rallies hosted a potluck to honor the courage and struggles of millions of refugees who are displaced worldwide. in the global Syrian refugee crisis? Harrisonburg, VA – Rocktown Rallies is hosting a potluck to commemorate World Refugee Day on June 20, 2016. The event will be held at Emmanuel Episcopal Church, 660 S. Main Street, Harrisonburg, at 6:00pm. World Refugee Day is an international event and a chance for our community to learn more about the global refugee crisis. The potluck will include an opportunity for attendees to collectively brainstorm about how we can genuinely welcome our newly resettled refugee neighbors, as well as to consider how we can act locally to make a global impact in the ongoing humanitarian refugee crisis. Come and join us in honoring the courage and struggles of more than 15 million refugees displaced worldwide by war and persecution. Anyone who would like to attend is asked to RSVP at http://tinyurl.com/RRpotluck. Rocktown Rallies is a group of concerned Harrisonburg residents who are dedicated to help Syrian refugees in the midst of the world's biggest humanitarian crisis. We are a grassroots advocacy group who also supports local resettlement efforts for refugees from all areas of the world. The mission of Rocktown Rallies is that our combined efforts will make resettlement easier for diverse refugees arriving in our community; that our advocacy will make a difference in local, state, and national policies regarding Syrian refugees; and that our service will demonstrate that good things happen for refugees and for our communities when we work together. For more information, please visit www.RocktownRallies.org.